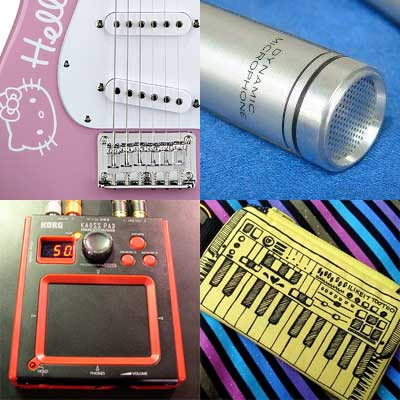 See also: 11 crazy expensive Christmas gifts for musicians, and my 2005 Gift Guide, which still stands up OK.
3. Lap Steel My wife bought me a lap steel for my birthday this year, and it's awesome. They're cheap, easy to play and cool-sounding. Make sure it comes with a tone bar, or they won't be able to play it on Xmas day. £50-90 from eBay UK|$100+ from eBay US. 5. Pocket Pod Powerful little headphone amp and effects box with sounds 'borrowed' from vintage gear. £65 UK|$130 US. 8. A print by James Joyce You can't buy any of his excellent music gear paintings but there's much to love in his shop. £75 and up. 10. Something from Liam Devowski Liam does awesome illustrations and graffiti of synths. Perhaps if you ask him nicely, he'll sell you something! $POA. Similarly Dan McPharlin makes incredible tiny cardboard synths, and takes commissions. 15. Something from Etsy There are plenty of great homemade/one-off crafty gifts for music geeks at Etsy. Try some of these keywords: synth, Moog, boom box, cassette, and 83 pages of guitars. 20. Build your own guitar kit Not so much a present as a sentence to a January of tinkering and painting. £54 from Thomann. Alternatively, a generous Warmoth gift certificate would satisfy a more serious fiddler. Wow, I never thought of looking on etsy for audio gear. You are a star, you are! The Moog-inspired music link is great. Thanks! A very timely list. My brother is into music, but I'm completely tone deaf, so presents is a bit difficult for me. This list however has some good ideas. Just in time for my Christmass shopping. They are on sale for $22 for a microphone now and sound surprisingly great. My housemate bought a pair and I was skeptical, but they really do sound great especially for the price.